Canada's 2008 annual commercial seal hunt in the Gulf of St Lawrence and around Newfoundland, Quebec and Nova Scotia began on March 28. The hunting season lasts from mid-November to mid-May, but the hunt mainly occurs in March and April. Canada's seal hunt is the world's largest hunt for marine mammals. It is cruel and that it ravages the seal population. The total allowable catch for 2008 is set by the Canadian government to 275,000 harp seals, 8,200 hooded seals and 12,000 grey seals. The Canadian government has issued 'regulations' which 'supposedly' makes the seal hunt more humane: A new rule in the Marine Mammal Regulations for 2008, require hunters to slit the seal's main arteries under its flippers, after clubbing or shooting a seal. The hunt in the southern Gulf of St. Lawrence started on Friday March 28, 2008. A handful of sealing vessels set out before dawn from the Magdalen Islands. In the first hour of the hunt, 15 seals were killed. The ice had made it hard for the 16 vessels, carrying roughly 100 hunters, to get near the seals. Per March 30, about 1000 had been killed. On March 30, the hunt in the Gulf of St. Lawrence, opened for the people from New Brunswick, Prince Edward Island and Nova Scotia. Per April 18, Sealers in the Gulf of St. Lawrence had taken about half of their total allowable catch (TAC) of 51,500 seals. The biggest part of the 2008 Canadian seal hunt takes place off Newfoundland and Labrador, known as the Front. Per April 18, sealers on the Front had taken 56 % of a total 194,000 seals allowed to be taken in the area. Per April 18, longliners on the Front had taken ca 79 % of their TAC of 112,000 seals. Small boats on the Front had taken 27 % of their TAC of 71,000 seals. Most of the seals that are hunted, are young harp seals, called beaters.. They were whelped (born) in February or early March in whelping patches on the ice. Such patches vary from 20 to 200 square kilometres, and may contain as many as 2,000 adult females per square kilometre. The pups are abandoned by their mothers at two weeks of age, and remain in the whelping patches until the ice starts to melt in March or early April. The hunt takes place in and around these whelping patches. The European Union is considering a ban on all seal products. 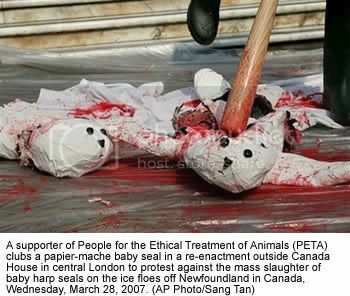 A Canadian delegation headed to Europe in March 2008, to lobby for the hunt. The delegation includes Canadian Fisheries Conservation representative Loyola Sullivan, Nunavut Premier Paul Okalik, Newfoundland Natural Resources Minister Kathy Dunderdale, Fur Institute of Canada executive director Rob Cahill, and sealers Mark Small and Denis Longuepee. The delegation travels to London, Brussels, Berlin, Vienna and Paris. Collaboration between different protest groups, organizations, and committed individuals is the way forward. Join my group! We the undersigned oppose to the continuance of the seal hunt. Canada's commercial seal hunt is opposed by the overwhelming majority of people in Canada and around the world, and governments are increasingly taking action on behalf of their citizens. In 2007, the U.S. House of Representatives passed a unanimous resolution calling on the Canadian government to end the commercial seal hunt. In recent years, Belgium, the Netherlands, Austria, Germany, Slovenia, France, Croatia, Italy, Mexico and Panama have either ended their trade in seal products or announced their intentions to do so. In 2006, the European Parliament passed a resolution calling for an EU wide ban of seal products, and the Council of Europe called on its 46 member states to promote initiatives aimed at prohibiting the trade in seal products. Notably, 67 percent of Canadians holding an opinion support foreign nations banning seal product trade (Pollara 2007). As the slaughter continues, many people are expressing their opposition by boycotting Canadian products. To date, half a million individuals and over 3,500 restaurants, grocery stores and seafood distributors have pledged to avoid some or all Canadian seafood to pressure Canada to end the seal hunt, costing Canada's fishing industry many times the value of the seal hunt. Notably, Canadian seafood exports to the United States alone bring in about $2.5 billion to the Canadian economy, which stands in sharp contrast to the roughly $12 million in landed value contributed by the commercial seal hunt in 2007. You have an unparalleled opportunity to protect Canada's economy and the seals. There is little economic reason to continue the commercial seal hunt and every reason to end it. Please do everything in your power to stop the cruel and needless slaughter before it is too late.